When it came time to propose, Eddie planned for an unforgettable moment. While Tamra and Eddie were on a romantic retreat in Bora Bora, the couple went deep-sea diving and collected shells along their underwater excursion. 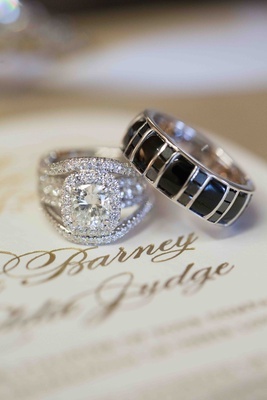 Eddie came up to the surface with a special clamshell that held a dazzling token of his love, which Tamra accepted through tears of happiness. Though their engagement lasted a year and a half, the couple planned for a beautiful seaside celebration in a mere five weeks with the help of a team of talented professionals. 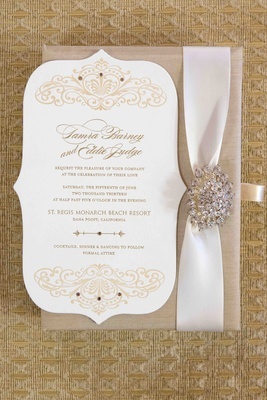 The “beautiful ocean backdrop” was the deciding factor that led the couple to book St. Regis Monarch Beach Resort. 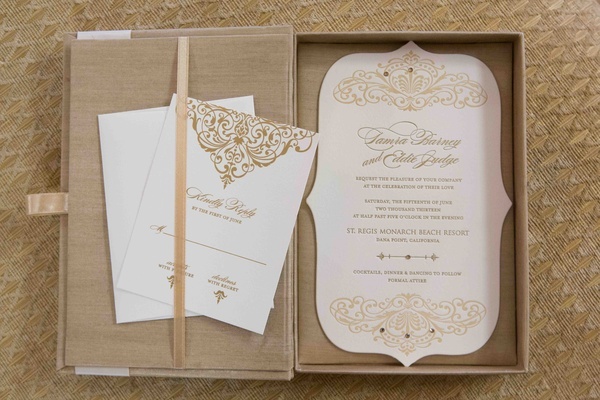 A sophisticated color scheme of blush, crème brulee, and gold was used to create an event like no other, beginning with an ivory invitation suite featuring gold foil and subtle embellishments tucked inside a silk box. 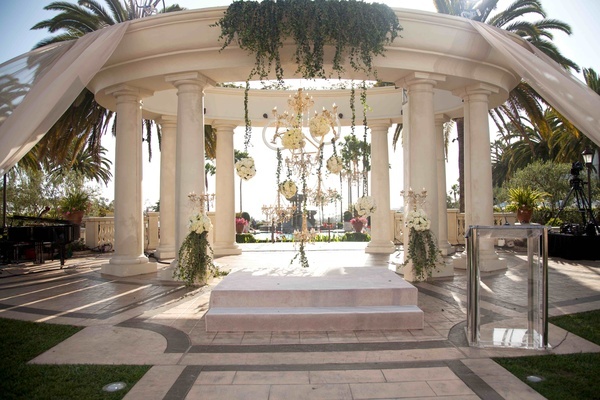 Ceremony seating was arranged around a towering gazebo that featured billowing sheer fabric and understated creamy floral arrangements. The most magnificent ornament was a surprise from the bride to her groom as a nod to the groom’s passion for cycling: a chandelier featuring a bicycle composed of florals and crystals. 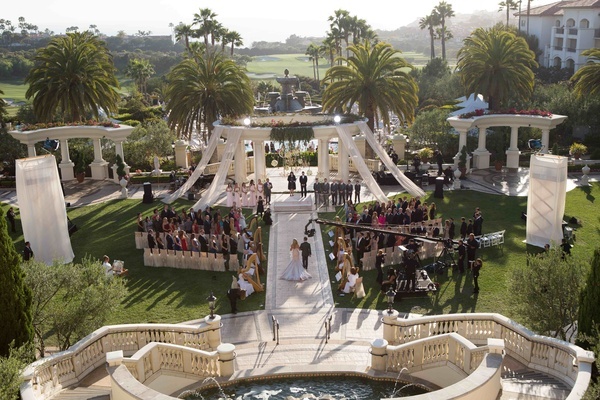 A hundred guests sat on the manicured lawn of the luxurious property awaiting the bride, who appeared on the arm of her eldest son. 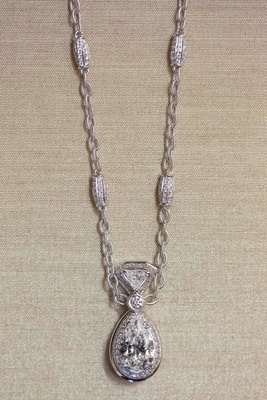 She wore a beautiful strapless gown in the palest of pink that featured glistening crystals that beautifully reflected the sunlight. 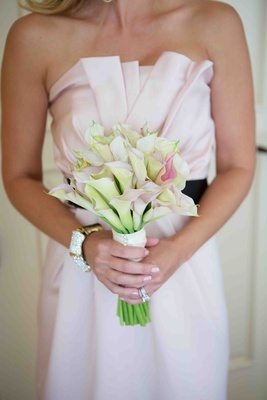 On her wrist she wore a stunning crystal cuff with cascading orchids created especially for her by her wedding designer. Friends and Housewives served as bridesmaids; each wore a long blush gown of her choice and held a nosegay of calla lilies in muted hues. 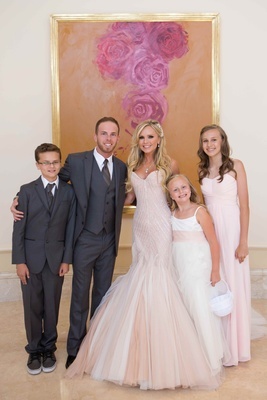 The heartfelt vow exchange elicited smiles and tears from the crowd, but the bride’s favorite moment was when Eddie tenderly recited handwritten vows to her children. “It was a moment that I’ll never forget,” Tamra shares. 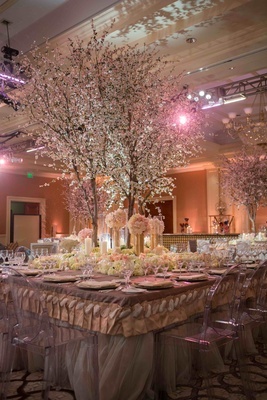 At the conclusion of the service, guests filed into an amazing reception ballroom splashed in hues of blush, ivory, and silver detail. 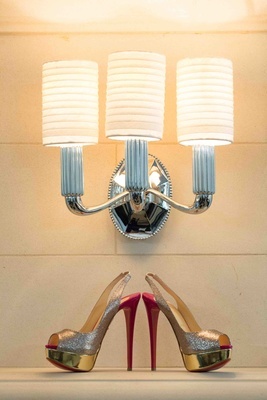 “The room looked magical,” describes the bride. The groom admits that he didn’t know what to expect, but he was equally stunned at the transformation of the space. “I was amazed by the beauty of it all,” he confides. Meanwhile, the bride had changed into her dinner ensemble: a fitted gown with a sheer neckline and silk skirt. The couple took their seats at a sweetheart table dressed in satin and tulle, and sprinkled with lush floral arrangements. 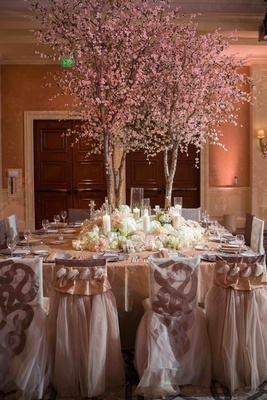 Glorious cherry blossom “trees” emerged through the centers of alternating tables, framed by rows of roses and tall glass vases holding bunches of fresh dahlias. 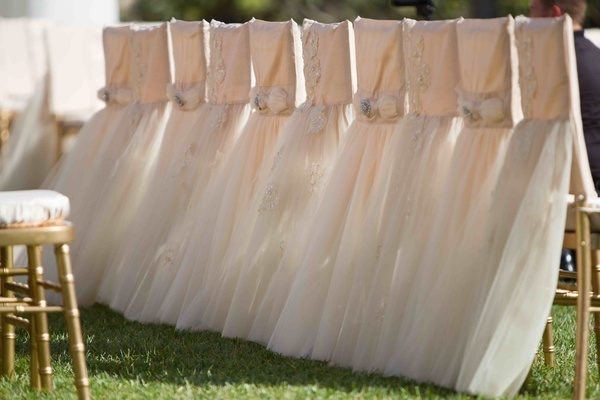 Tables were draped in grand linens that alternated between gold and taupe silk dupioni, while Ghost or chiavari chairs were finished with layers of dreamy tulle. Crystal glassware sat at the top of place settings that featured shell-shaped chargers and custom menus. 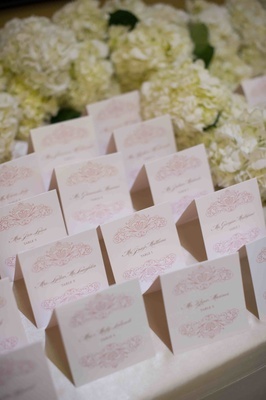 Each satin napkin held a reprint of a beautiful love letter that Eddie had secretly written to Tamra. 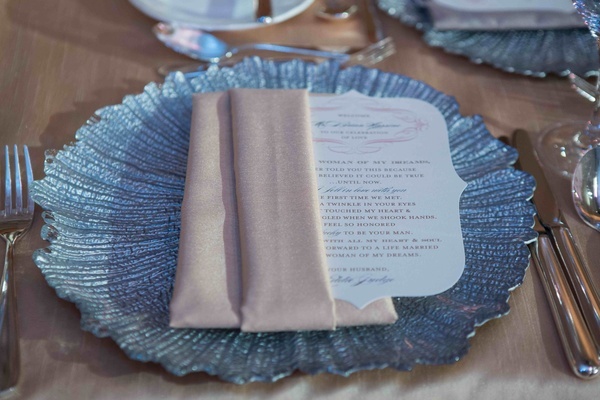 “I asked our wedding designer to put them at each place setting so when guests took their seats, they were able to read the words in my heart,” explains the groom. Faceted chandeliers and cut-crystal accents added sparkle to the space, yet eyes were immediately drawn to the stunning wedding confection that was suspended from the ceiling. Decorated in creamy white fondant, each of the five tiers was uniquely adorned by sparkly silver details. 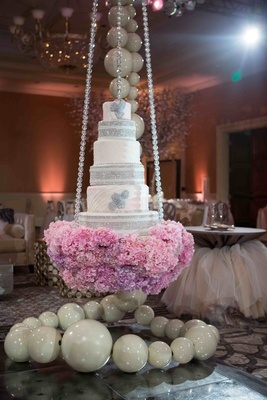 The base of the “swing” that held the cake was outfitted in a plethora of pink hydrangeas and hung from crystal chains, while strings of oversized pearl decorations completed the striking look. After a delicious sit-down dinner service and several sweet toasts dedicated to the couple, Tamra and Eddie slipped away so that the bride could slip into a third gorgeous gown. The couple reappeared for their first dance, a sultry cha-cha they had prepared. “Incorporating a Latin dance was important to me,” confides the groom. The room was filled with energy as the pair quickly danced from one end of the dance floor to the next. “It was an amazing feeling to see our loved ones so happy for us,” remembers Tamra. The festivities of the special day were infused with the couple’s combined personalities and culminated in a day of love, happiness, and the joy of becoming husband and wife. Tamra and Eddie couldn’t have wished for anything more, and agree that they wouldn’t change even the slightest detail of the celebration. “It was perfect in every way,” confirms the bride.